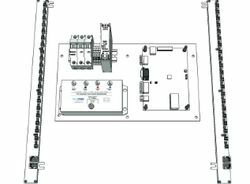 The EnerSure® iBCPM (Integrated Branch Circuit Power Meter) system takes up very little space and can be easily integrated into new PDUs and panel boards. It records power parameters such as volts, amps, power factor, watts and kWh which are important for operating IT devices and the surrounding infrastructure - for every branch circuit with maximum metering accuracy. Based on this data, the efficiency of power use can be calculated, evaluated and increased for every supply circuit. 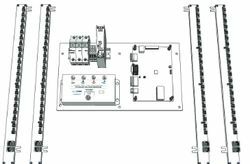 An individual iBCPM system has 21 power metering units per panel board and can operate up 4 panel boards with a total of 84 power metering units. The optional EnerSure® bus cards can be used to expand the iBCPM system with 4- or 8- unit modules for monitoring up to 120 branch circuits. Pluggable CT modules make it possible to replace the current transformers of the iBCPM solution. These are available in standard versions between 75 and 300A as well as up to 4,000A. The TrendPoint xD processor of the iBCPM solution makes it possible to automatically record data and log events. All data can be easily transferred to all conventional BMS or DCIMTCP applications for further processing via TCP Modbus, SNMP or BACnetIP communication protocols.